I made the big crepe paper bow by rolling it in larger and larger loops and then stapling the middle. I added a loop of tickets from the Funhouse Collection in the center as well as Chipboard Wheel and Mini Flag. The strips of patterned paper are also From Funhouse. I mounted everything on a piece of black cardstock. The best part, though, is the mustache on a stick that I thought my kids would totally get a kick out of taking pictures with! Even little (non candy lol) gifts are more fun if you dress up the gift bag! 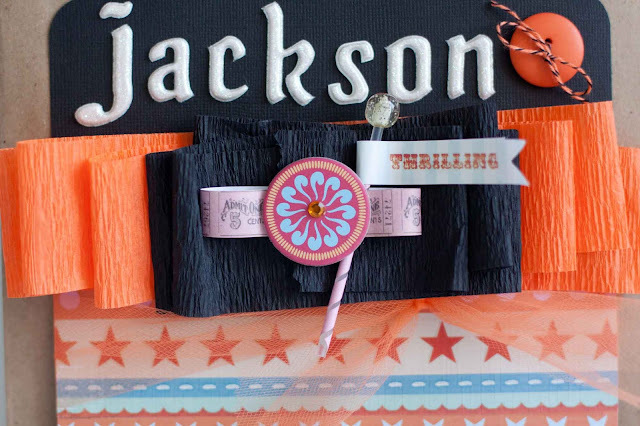 GCD Studios Funhouse Collection patterned paper, Mini Flag, Chipboard Wheel and ticket trim from Ribbon Spool. Love the mustache on a stick! these are sooo delightful Rebecca! 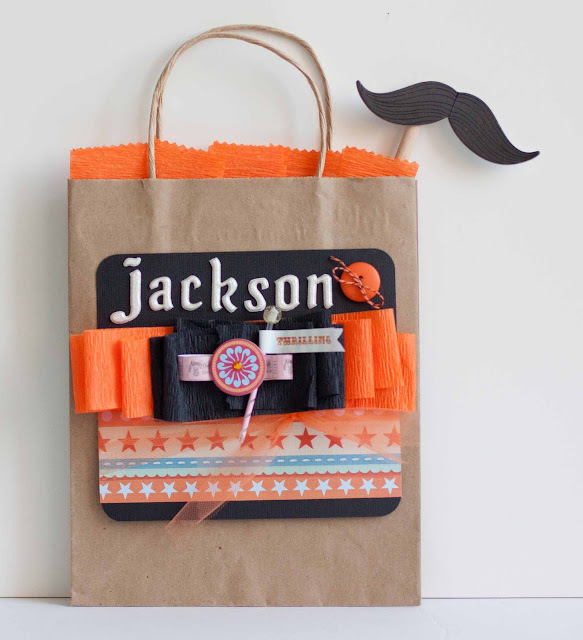 The crepe paper is such a great embellishment idea. Thanks for sharing it! Your treat bags look great. oh this turned out SO awesome!! Ahhh I love these! I love Halloween!